Mrs. Theresa E. (Cerasale) Matteson of 256 Spring Street, Meriden, was born June 15, 1898 in Meriden, daughter of Meriden native Catherine (Brennan) and Italian-born Angelo Raphael Cerasale. She was found seriously injured at the circus grounds after the fire on July 6 and brought to Municipal Hospital where, despite treatment, she died from her injuries later that evening. She was buried at Walnut Grove Cemetery in Meriden after services at Lamphier Funeral Home. 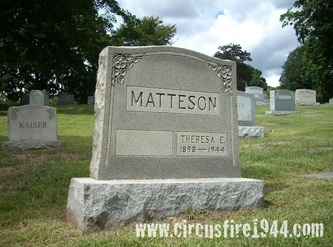 Mrs. Matteson is survived by her parents, of Cheshire; her husband Howard R. Matteson, age 50, who was injured in the circus fire; two daughters, Shirley, 19, and Dorothy, 23; four brothers, Ralph, John, Joseph and Angelo Cerasale; and two sisters, Viola and Catherine. Her estate was awarded $8,150 by the arbitration board.